40 lbs. of Pellets Free! Fast Eddys is known Best for his FEC line up on the BBQ Competition Series, now he has one of the finest Smoker & Direct Grilling machine for the Backyard with the PG500. This is a commercial grade smoker built for competition or Backyard smoking. With a temperature range from 180-600 degrees this is one of BBQ Island's Best Selling Smoker for 2 years Straight. The PG500 holds a Full 20lb bag of your favorite wood pellets and features a easy to use drop hatch to switch to a different favor pellet. The PG500 is one of the only Smokers that features a direct flame and smoke area without having to remove or add anything. 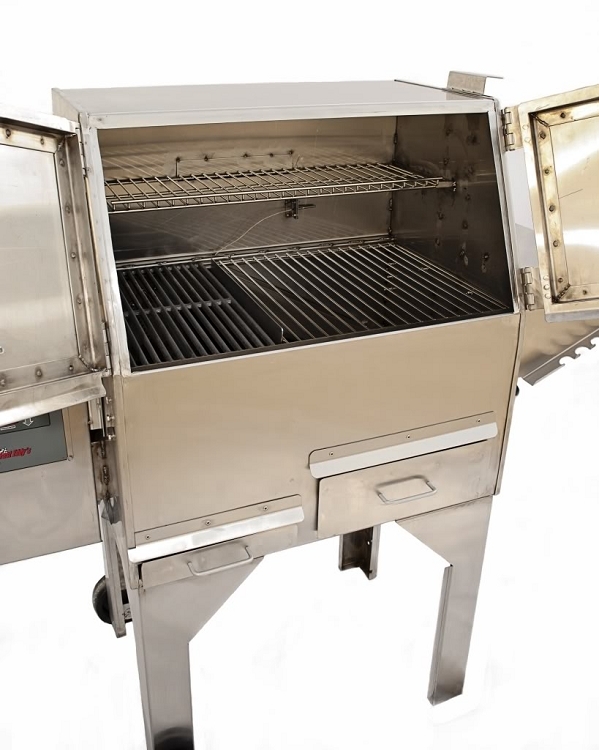 The PG500 features a 18x18 smoke area and a 10x18 direct grilling area with a large warming rack combined has a total of 784sq inches of cooking area. Includes casters on legs for portability. 40lbs of Free Pellets! With a fast start up, continuous even heat, and precise temperature control this hardwood pellet smoker will give you consistently delicious hot-smoked products and succulent barbecue. These ship direct from Cookshack but we do keep them in stock at our warehouse in Arizona, if you need faster shipment times call us for expedited delivery at additional cost. The PG500 is made in the USA. 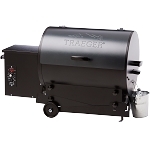 Its 18-gauge stainless steel interior is a stronger than the black carbon steel used in many other brands of smokers. Exterior is 20-gauge stainless steel. 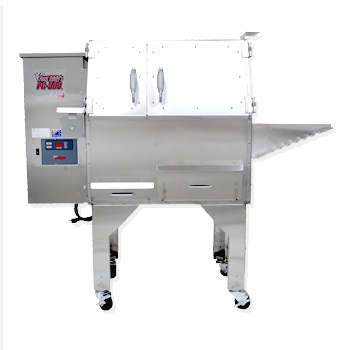 The PG500 is USDA and NSF approved, ETL listed and CE Certified. 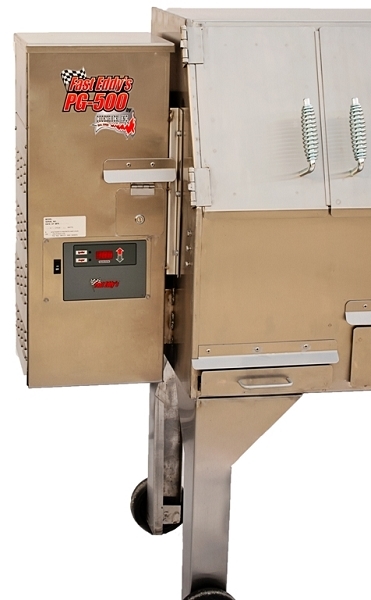 The PG500 thermostatically-controlled temperature eliminates large heat fluctuations that dry and shrink meat. It knows when the smoker needs more fuel; you can go away and leave it to do its job without your attention. Easy, flip-of-the switch starting brings the PG500 rapidly up to smoking temperature. Burners stay on when doors are opened; heat recovery occurs in as little as 10 minutes. Because the PG500 is 100% wood pellet burning, for both its heat source and flavour source, results are consistent. In gas log-burners, the wood logs get smaller as they burn, and as new product is added, wood must be added as well. Since product is cooking while new wood is added, flavour is affected. A standard meat probe hole allows the user monitor your meat with optional temp to a desired internal meat temperature - the key to producing juicy smoked cuts such as pork shoulder, Boston butts, brisket and even chicken. Meat drippings exit the bottom of the smoker into a removable drip pan. 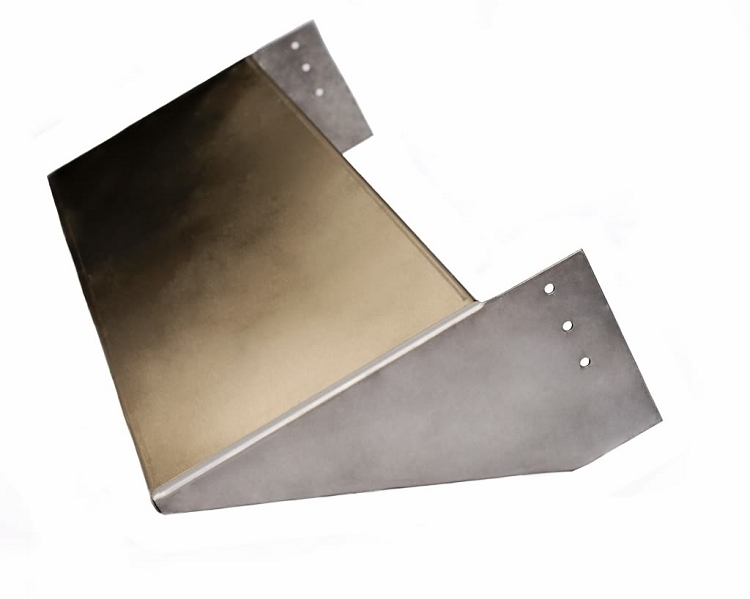 Empty the drip pan after each load for clean and safe operation. The smoker is easy to clean and ashes are easily disposed of. Inner accessories remove for easy cleaning. Casters are now a standard feature. The PG500 Includes 40 lbs. of Pellets Free!